For more than two decades, The City Club of Cleveland has hosted the annual High School Debate Championship. While most high school students are watching basketball finals and preparing for spring break, these enterprising students prepare for the High School Debate Championship, as well as for state and national competitions. The City Club gives them the opportunity to show-off their skills. Every year, the top two area high school debaters square off in a classic "Lincoln-Douglas" style debate at a Friday Forum. This gives the debaters the opportunity to compete - not only for the judges and the audience in the room - but also for our radio and television audiences. 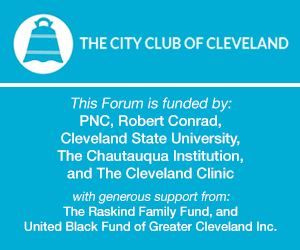 Debate teams from across Northeast Ohio are invited to attend as guests of the City Club and BakerHostetler. The High School Debate Championship is sponsored by BakerHostetler in memory of Patrick J. Jordan. Mr. Jordan was a partner of the firm and an outstanding debater in high school. This year's debate is between Gigi Protasiewicz of Hathaway Brown and Omer Ashruf of University School. The resolution is ​the United States ought to promote democracy in the Middle East.